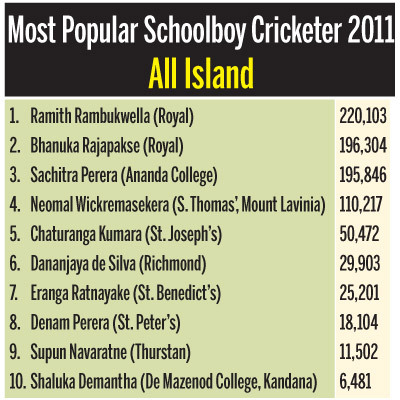 The final count for both categories _ Schoolboy Cricketer of the year 2011 in the All Island and Outstation is stimulating up as the curtain comes down on the competitions on Wednesday May 18, with the last Coupon No. 20 in the Daily News. Entries close on 19.05.2010. The Sunday Observer will carry Coupon No. 20 today and the closing date for receipt of coupons will be on Thursday May 19. Please note that there will not be a readers prize (Cash or T - shirts) in the competition from this final stage onwards. Royal skipper Ramith Rambukwella, Anandian Sachitra Perera and the other Royalist Bhanuka Rajapakse have been in the forefront of the competition from coupon number one. Royal College captain Ramith Rambukwella looks the firm favourite to take the All Island title, but Anandian Sachitra Perera and the other Royalist Bhanuka Rajapakse are still close contenders. 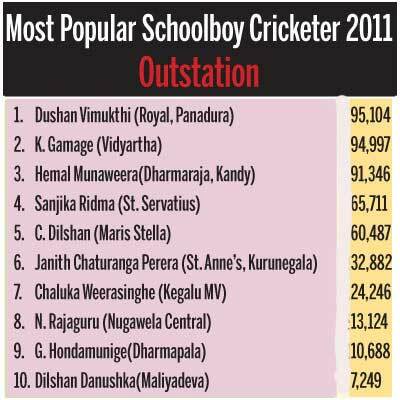 Rambukwella who is placed at the top position has polled in 220,103 and Bhanuka Rajapakse who won the main award (Schoolboy Cricketer of the Year last year) has polled in 196,304 to secure the second place. In the Outstation category, there is going to be a close tussle for top berth between the first two contestants Keshan Gamage of Vidyartha College, Kandy and Dushan Vimukthi of Royal College, Panadura. Vimukthi who was placed second last week has gone to the front this week with 95,104 votes and Keshan Gamage has dropped down to number two with 94,997 votes a difference of 107 votes. It seems the fight for the first place in the Outstation segment should be more intense with the competition coming into a close this week.